Nothing lasts forever. At a quarter nine in the evening of the 6th November 1944, a Mosquito bomber returning home from a raid on Gelsenkirken iced up as it descended through cloud near the small Norfolk town of East Dereham. The plane came spiralling down towards the Norwich to Fakenham road, and crashed right into the middle of the village of Bawdeswell. Fortuitously, it landed right on the village church, which it completely destroyed. The wrecked building had been an early Victorian church by John Brown, which itself had replaced an 18th century mock-classical building. The tower of the medieval All Saints had collapsed into the church and destroyed it in 1739; as often in East Anglia, neglect of a structure principally built of flint had led to its demise. Over the centuries, English parish churches have always been extensively rebuilt; the process just continued for longer at Bawdeswell than it did elsewhere. When the villagers came to choose a design for their new church, we may assume that they at least looked at something modernist - this was, after all, the 1950s, and the Festival of Britain was encouraging the clean lines and light spaces that would flush away the neurotic elaboration and darkness of much of the architecture of the first half of the century. Barely a hundred miles off, one of the great buildings of the century was going up in Coventry, where the city's cathedral, formerly the parish church of St Michael, had been gutted in the blitz. In fact, no East Anglian parish churches destroyed in the Second World War were replaced by determinedly modern, or modernist, buildings. Some were not replaced - there seemed little point in rebuilding those lost in the Norwich blitz, because the city already had so many redundant worship spaces. In Suffolk, Basil Hatcher replaced the destroyed church at Chelmondiston in a textbook example of Decorated Gothic. And, most famously, at Great Yarmouth, the vast civic church of St Nicholas was rebuilt by the eccentric Stephen Dykes Bower as if none of the centuries from the 16th and 20th had ever happened. It was never likely that the Bawdeswell parishioners would be feverishly dialling up the steel and concrete manufacturers. Many early 19th century parish churches have not worn well; coming before the flowering of that century's architecture, they tend to be dark and dingy, their fittings are anachronistic, even absurd, and there is no reason to think the parishioners of Bawdeswell had a special fondness for the lost building. Indeed, what they chose to replace it seems almost a direct reaction. Rejecting both Gothic and Modernist forms, they chose something that is basically neo-classical, in the style of the 18th century but with elements of a Wren City of London church, and the flavour of New England. The material, if you please, would not be stone but Norfolk flint and shingle. The architect was James Fletcher Watson who, in his nineties, could return to the fiftieth anniversary celebrations, and survey his work with pride. At the time it was built, and in the decade or so afterwards, his work, and their choice, was scoffed at as being architecturally illiterate, in what Betjeman once described as being 'ghastly good taste', but in fact it has stood the test of time rather well. At this distance, there is a Festival of Britain cleanness and light to its lines, and although it is a very simple building it resists the blandness of the later 1980s shopping-centre-school of neo-classical, as found at, say, Quinlan Terry's Brentwood Cathedral. It will last. If required, it could still be in use for centuries. 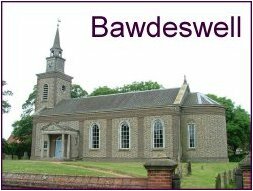 The villagers of Bawdeswell are unusual, of course, in that they have had a say in what their village church looks like. Most medieval churches, at least before the 15th century, evolved organically as elements were replaced or added on. In the 15th century there were some massive rebuildings, most famously in this part of Norfolk at nearby Salle; but they were the gift of the great families, who most often were attempting to enforce the orthodoxy of Catholic doctrine, most appropriately expressed in Perpendicular architecture. Taste didn't enter into it. After the Reformation, as the function of these buildings changed, surprisingly few were completely rebuilt, or even added to very much. East Anglia has only a handful of 17th and 18th century churches. It wasn't until the 19th century that another great age of church building arrived. The new churches were most often in response to the Industrial Revolution, which increased the population of towns, and also created a depth of poverty and need that provided a wake-up call for the Church of England. The Church also had to respond to the burgeoning non-conformist movements, as well as the return of the Catholic Church to England after an absence of some three centuries. At Oxford University, there was a body that urged the reinforcing of the Church of England as a great national church; the likes of Keble, Newman and Pusey feared that it was becoming side-lined as a protestant sect. The Oxford Movement, and Cambridge University's similar Camden Society, sent out a great wave of ideas, many of them concerned with the connection between architecture, liturgy and doctrine. 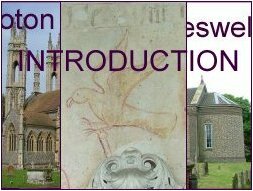 The Church of England underwent a great revival, and in East Anglia this is reflected in hundreds and hundreds of church restorations, some of them excellent, many of them fascinating, a few perfectly dreadful. Where there was money and a will to do so, parish churches were occasionally completely rebuilt in the late Victorian period. Sometimes, this responded to a real need if the church was very badly decayed, or remote from the centre of population. But often, it reflected the enthusiasm of a Rector with a rich patron. 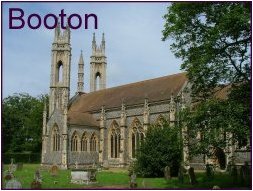 Sometimes, as at Booton, the Rector and the patron were one and the same person. The Reverend Whitwell Elwin had inherited the Booton living on the death of his cousin, and would remain there for more than half a century. He was a nationally noted man of letters, the editor of the High Tory Quarterly Review, and a regular commentator and correspondent in the London press. It is said that the Booton postbox was installed by the Post Office specifically to meet his personal letter-posting needs. Over the course of about 25 years, he turned Booton parish church from a homely medieval building into a fantastic palace, with towers and minarets on the outside, and hosts of angels on the inside, the woodwork and stained glass spectacular in nature, the fittings elaborate and of the highest quality. To see it now, you might think that Elwin was a high Anglican, perhaps even an Anglo-catholic; in fact, this appears not to have been the case. He was, rather, an individualist, an English Eccentric, who used as models for the angels in the windows his many intimate young female friends, his 'blessed girls', as he called them. With two of them, he toured the cathedrals of England looking for architectural forms to use; one of them contributed, over the course of ten years, almost £300,000 to the project, about six million pounds in today's money. Meanwhile, his evangelically-minded wife kept the rectory, which he himself designed, devoid of carpets and curtains. The quality of Elwin's work is superb - but of course, there is no longer a congregation. He has been immortalised by it, but his church is now redundant, and in the care of the Churches Conservation Trust. Booton church is a vision of heaven - or, at least, the Reverend Whitell Elwin's vision of heaven. As a fully paid up member of the squirearchy, he was sending a pretty strong message to his congregation. We can only guess at his influence, or that of other Victorian clergymen, over the imaginations of the parishioners. For a medieval Priest, things would have been quite different. Medieval worship was less congregational, more devotional, and the role of the Priest at Mass was not so much to lead worship as to embody it. His was the chancel; its upkeep was his responsibility, and certainly by the late middle ages it had become his exclusive domain. The nave was the place of the parish; they built it, and it was the people who fitted it out for the devotions and rituals that Catholic worship demanded, most particularly the sacraments of the Church. Here, parishioners could follow their personal devotional path, albeit in public, in the presence of the Host. As the middle ages proceeded, the furnishings and decorations of the nave seem increasingly to suggest an enforcement of Catholic orthodoxy, in contrast to these personal devotions, and perhaps superstitions, of the ordinary people. Where does this come from? Was it imposed from above? Or was it the increasing influence of the great landed families that brought it to bear? Whatever, it is in the 15th century that worshippers begin to become a corporate body. How is Catholic orthodoxy reflected in the decoration of these late medieval buildings? Once the Black Death had been survived,there seems to be a change in the priorities of the medieval mind. Images in stone, glass and paint become increasingly concerned with doctrine and with cathechetical tools. At Heydon, the north aisle is taken up with an immense late 14th century image of the Three Living and the Three Dead; three knights out hunting meet three corpses in increasing states of decay. As you are, so once were we, they are told. As we are, so you will be. Is this just a warning about the inevitability of death, and a call to repentance? Or, more subtly, a meditation on the transitoriness of worldly things? For the medieval mind, death did not come as an end; rather, it was a transition. Dead parishioners were still called to mind as members of the community; they were prayed for, and it was assumed that they were still praying for the living. Wealth was not forever, and immortality existed for all, as long as praying for the dead did. The material world was a temporary thing, a passing shadow. Also surviving at Heydon is a beautiful image of the adoration of the Magi, once part of a sequence of events in the story of Christ. Why were these made? It is too simplistic to think of them as some kind of 'poor man's bible', superceded once parishioners had access to the vernacular written word. Rather, they were devotional tools, to be meditated upon, almost certainly as part of a rosary sequence. It was important enough that Mass was happening. There was no call to participate in what the Priest was doing; rather, this was the time to pray devotedly and silently, beads in hand, eyes focused on the walls. Worship was active, not passive. 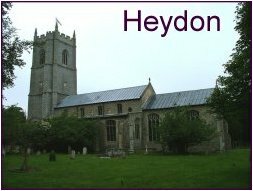 Curiously, as at so many churches, the Heydon wall paintings are punched through by later windows which were placed there before the Reformation. It is as if, during the 15th century, the need for the public manifestation of private devotions came to an end, and was gradually overtaken by an increasingly passive, corporate act of worship. It is no coincidence that this was the time that pulpits first appeared, and the roods were built larger and higher, filling the east end of the nave, a constant reminder of the central mystery of the Christian faith. With the coming of the pulpit, the Priest left his chancel and entered the domain of the people, taking it over. All eyes were fixed on him now. The paintings could be whitewashed, perhaps a century before the Reformation, and the great Perpendicular windows filled the nave with light, the plowman gazing in wonder on the rood, his attention gained, his head buzzing with ideas that may or may not have been beyond his comprehension. There would be no going back.